​(719) 338-9692. Assistance is available as you start your journey to becoming a NCTM! See Angelia's certification story below. MTNA Professional Certification promotes excellence in the field of music by encouraging life-long study to raise individual music teacher's levels of competency, effectiveness and professionalism. The designation of NCTM, Nationally Certified Teacher of Music, identifies to the public the applied music teachers who have met the standards set by MTNA. If you would like to be the recipient of these gifts (and more! ), please download the application packet. Certification is also the gift that keeps on giving. Ongoing musical growth is one of the benefits of the Renewal of MTNA Professional Certification. Be sure to visit the web site listed above to view the latest Renewal Activities and Points Form. Whether you are considering pursuing certification as an individual or in a group, now is the time to begin. I encourage you to get started today. ​For several years I was a member of MTNA, but not a contributing member. I received newsletters and information but did not attend meetings, volunteer, nor register my students for any events. Finally, after being a lone-ranger teacher for too long, I decided it was time to overcome some personal insecurities. I participated in a few Pikes Peak Music Teachers Association meetings and attended a single day at the 2014 CSMTA Conference. I discovered that my feelings of intimidation were unfounded. I was actually encouraged! It seemed that I had found a place to grow and become a better teacher for my students. It was a pleasure to meet new colleagues. At the conference I was reunited with my master teacher, Sara McDaniel NCTM, who introduced me to June Ewell NCTM, certification mentor. That day a distant dream was revived in me. My story goes back to 2009 when I started the process to become a Nationally Certified Teacher of Music. Although I had already earned my BA in Music, it was determined that I needed to take proficiency exams in music history, pedagogy, and a final comprehensive essay exam (no longer part of the certification process) to fulfill the requirements. The energy I started with quickly became a whirlwind of self-doubt. How in the world was I to prepare? Life circumstances shifted and I was no longer taking private lessons with Sara, my biggest source of encouragement and mentorship. In addition to a few mountains of details, I needed to polish up my philosophy of teaching, re-work my studio policies, and take a closer look at my business practices. But how? To study thick textbooks of history and revisit college files of pedagogy was one thing, but how would I recall the masses of information? Memorization of facts made me dizzy! Clearly, I was overwhelmed! One would think that a college experience would have prepared me for the demands of professional certification. As I wrestled with the stacks on my table, time lapsed. I did not meet my exam dates and I truly believed I did not have the mental capacity to accomplish my biggest professional goal, national certification. Defeat stung! I worked through the disappointment and became the lone-ranger teacher I introduced you to earlier. I was a “quiet member” of MTNA. 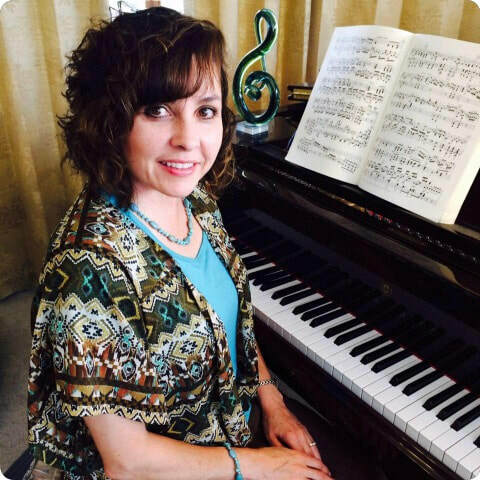 I taught K-5 Music in a public school for several years and then returned to teaching private piano, my career of choice since 1991. I prepared my students for annual studio recitals but always kept things low key. Festivals, competitions, and interacting with other local studios were not things I aspired to, especially after my failed attempt at certification. Over the years I enrolled in a few of Sara’s pedagogy classes at the community college to stay updated on new ideas in teaching methods and curriculum. I was an independent teacher, a conscientious teacher, but sadly, not a confident teacher. All of my students and their parents seemed pleased with their piano lesson experience. I even received an occasional referral. But I struggled to believe that I was an excellent teacher. I realized that unless I made a concerted effort to place myself in uncomfortable places to grow, nothing was going to change. That’s when I decided to attend a few PPMTA meetings and go to the conference, but ONLY for one day. I knew I would be around highly qualified teachers and it made me feel uneasy. It seems a bit humorous now because I was welcomed and have never been made to feel uncomfortable. When my path crossed Sara’s and she introduced me to June, a whole series of events began to unfold. I learned that June was certified under the same guidelines that I had started five years earlier. Since that time, the process had changed from exams to a project-based assessment. Following the conference, I checked the MTNA website and entertained the thought of following through on a long-lost certification dream. I called June and asked to meet with her for guidance. Taking a close look at the required Teacher Profile Projects, she encouraged me to accomplish as much as possible before re-applying with MTNA. “Once they are notified, the clock starts ticking and you have one year to complete the process,” she said. So, that’s exactly what I did. I started developing my projects. I met with June frequently to discuss the goals of coming weeks. She helped me to create doable goals and kindly held me accountable as I pressed forward. In addition, I started taking private lessons with Sara again. This time I had support, encouragement, and guidance as I worked some serious musical muscle! With a video camera set up by my piano, ready to work on one of the projects, an unexpected email came in from the MTNA certification department. “Your application has expired; however, we would like to offer you the chance to finish the process and become an NCTM.” I was moved to tears! A five-year-old application somehow became active again, just like my dream! They gave me the option to complete the exam process which I had already started; or to complete the Teacher Profile Project, which I was currently working on. Of course, I immediately contacted June with the news! We discussed the options and considered all that had already been completed under each set of guidelines. The time I invested to start the projects was time well spent because my studio benefitted. But I decided to take the proficiency exams. Why? Remember those pedagogy classes at the community college? Those classes met the criteria to waive the pedagogy exam! That left the history exam and the comprehensive essay exam to prepare for. The light at the end of the tunnel was closer than ever! June assisted me with resources, encouragement, and prayer as I studied harder than I ever had. Admittedly, it was daunting when I first cracked the books, but I kept digging in as each chapter passed by. Sara agreed to be an NCTM proctor for the exams on two separate days. There was a sense of relief that the exams were completed and submitted. But I cannot even describe how anxious I felt waiting for the results each time! July 2015, Music History, passing score! November 2015, Final Comprehensive, passing score! And on December 16, 2015, I received the long-awaited news from MTNA. It was a very special moment to open the envelope with my husband. With tears in our eyes we pulled out a certificate that declared I am a Nationally Certified Teacher of Music in Piano! I took a six-year route to certification. It was a sacrifice of time and effort, no question about it! But it was worth it. I am now an active member with MTNA and honored to serve on the board of PPMTA. I continue to take lessons with Sara McDaniel and am forever indebted to the investments she and June Ewell have poured into me. Although this certification probably means far more to me than to my students, I hope they are inspired by having a teacher who is willing to take risks, learn, and work hard to achieve a dream. Become an MTNA Teaching Specialist! Afford a means of communication, dialogue, and discussion among teachers. Extend parameters of knowledge through the reading of a variety of books. Utilize the interest, expertise, and experience of the selected leader. Provide program-building opportunity for local associations. Grant points towards the renewal of MTNA Professional Certification.